TheHellboy reboot is just around the corner, and it was only a matter of time until a cross-promotion for the film came around. However, fans may not have expected them to put up a fight in the process. Game publisher Ubisoft has announced that Mike Mignola’s signature character would be ready for battle in Brawlhalla. The deal comes as a partnership with Millennium Media and Lionsgate. In the cartoon-style free-to-play fighting game, multiple combatants duke it out until only one remains in the ring. It has some traits in common with Nintendo’s Super Smash Bros. Ultimate, but with its own distinctive touches. Hellboy, along with a few of his fellow characters, went through a redesign for the game. They have a more cartoon-style look than their film counterparts. There are three characters that will join the fire-fisted hero in battle. First up is Nimue, the villain from the film, portrayed by Milla Jovovich. Joining her is Gruagach, a warthog-like creature that serves as her right-hand cohort. And last but definitely not least is Ben Daimio, with Daniel Dae Kim in the role. This fellow B.P.R.D. agent transforms into a jaguar. He already takes this form based on the art above, but it’s unknown if he can transform into a human in-game. This marks Hellboy’s latest appearance in a beat-em-up. Last year, he became a playable character in Injustice 2, alongside others like the Teenage Mutant Ninja Turtles. Brawlhalla already has over 40 combatants to choose from, including Ubisoft’s star character Rayman. There is no specific release date for these characters just yet. However, Hellboy will hit theaters on April 12, so he should show up in the game somewhere around that date. 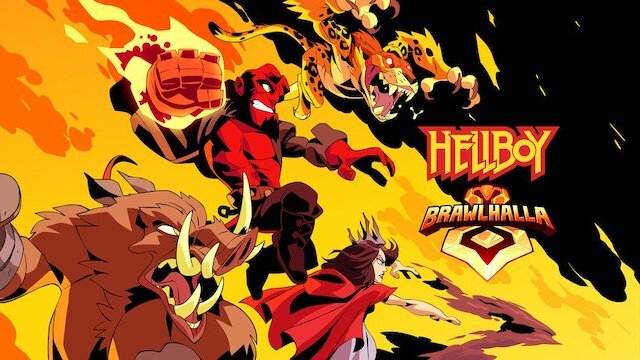 What do you think about Hellboy and his crew joining the Brawlhalla ranks? Let us know in the comments below!